The MLA Roles Action group contributes to awakening democracy by more clearly defining the people’s perspectives on the roles of our elected representatives as a basis for co-designing improved active citizen participation. Representation is a two-way ongoing dynamic relationship between citizens and representatives through which the self interests of constituents are balanced with our common good by a process of dialogue and deliberation. 2. To look for innovative methods for improving MLAs capacity for representation and citizens’ capacity to be represented. Both these lead into preparing for the 2020 ACT Election. 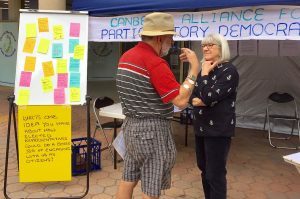 As well, the Group will undertake a Candidate Statement exercise with ACT candidates for the 2019 Federal Election. Organising a series of “focus group/co-design” conversations about roles and responsibilities of representatives to start with a pilot conversation in March. To be involved in this, please contact the Secretary. Meet with the MLAs who respond to discuss their responses. CAPaD set up a stall at SouthFest. We asked passers-by for their ideas about how elected representatives could do a better job of engaging us as constituents. Analysed the 2016 Candidate statements to inform next steps, prepared an ‘at-a-glance’ and more detailed report, and based our next set of actions on them. The take-home from this analysis is that our MLAs have a very limited view of what being a representative entails. Began planning to assess the MLAs who signed Candidate Statements during the 2016 election campaign, against their Statements. Began to widen the conversation to include more citizens and the MLAs (see Southfest notes).